The Audio Note range of speakers have a history which is both extensive and well documented. For the benefit of the uninitiated, I’ll give a quick run through in the next couple of paragraphs. In a (quite large) nutshell, the late Peter Snell designed and built speakers which Peter Qvortrup of Audio Note obviously regarded as being ahead of the pack. So, when those original Snell models were discontinued in favor of more ‘modern’ designs by designer Kevin Voecks, featuring less efficient drivers, narrower/deeper cabinets, floor standing, etc, Peter revived and upgraded Peter Snell’s two-way stand mounts under his own banner once he and Kondo established their own, separate enterprises. Hardly surprising when the Audio Note philosophy seems to be one of relentlessly pursuing the best sound regardless of the prevailing wind, which is invariably blowing a gale in the opposite direction; no doubt Peter’s hair (more later) is firmly held in place by a suitable hat when he and Andy Grove are getting their heads together designing the next AN product. The basic design cabinet dimensions and driver configurations remain the same; but as with the AN range of amplification and DACs, it’s largely the belief that anything copper can do, the highest purity silver can do much better, and the subsequent result is increased performance and, inevitably, costs, as crossover components and internal wiring are upgraded. Externally the AN-E SPE/HEs that I’m reviewing are available in over twenty different wood finishes, and there’s also the option of solid colours, including white and black; piano lacquer finish is extra, and Mario of AN was quite enthusiastic when describing how he once saw a pair of AN-Es in racing green with gold tweeter surrounds. Now to my first experiences with the review pair of AN-Es, although I had heard a pair some years ago when auditioning an AN DAC which I ended up buying. I’d arranged to pick the AN-Es up at the Northern Hi-Fi Show that is becoming increasingly popular in Manchester, England; and in order to familiarize myself with how they sounded in an all AN system, I waited until there was just an hour or so of exhibiting left before squeezing through the rather crowded doorway and finally parking my backside in the Audio Note room, my entry unnoticed by one Peter Qvortrup whose hair seemed to be considerably longer than I’d noticed on our last meeting some years ago. I had read somewhere that he’d recently developed an interest in heavy metal so perhaps he was getting into that particular ’scene’, although the mental picture of Peter playing air-guitar – stomping around a room while avoiding the exposed 300Bs atop a multi-thousand pound ONGAKU – was far too surreal to contemplate while sober. On first listen, the AN-Es don’t tend to grab you by your genitalia and put you into some multi-orgasmic state of bliss; but just as your most highly regarded, long standing friends tend to be those who didn’t try too hard to impress on first introduction by either showing off or by otherwise drawing attention to themselves, so too do the AN-Es quietly work their way into your affections by doing the job they were designed to do in an understated but highly efficient (no pun intended) manner – that job being to convey the intimacy of music to the listener while remaining a bit part player, not some narcissistic diva who wears a low slung dress to display her ample buxom. Make no mistake, the Revel F30s I’ve been using for the last two or three years are excellent speakers which have won plaudits from various audio organisations and publications the world over, which were coincidentally designed by Peter Snell’s successor, Kevin Voecks, who had moved on to Revel; but without making direct objective comparisons (something I can’t really do due to different placement and cabling anyway), I’ve got to say I now prefer the AN-Es for the simple reason that I end up listening to more music while they’re installed in my system, and that is THE ultimate aim of any piece of audio equipment… surely? To make music more enjoyable – or rather as enjoyable as you‘d imagine the live performance would be? To those readers who suspect I’m being seduced by any Audio Note house ‘sound’ and that there’s perhaps some warmth being added by the AN-Es, I’d suggest they’re not actually a million miles away from the F30s which are regarded as being as accurate/neutral in their presentation as one could reasonably hope for in a similar price bracket, and that the 100wpc E.A.R. valve amplification I use definitely IS a million miles away from displaying any euphonic tendencies, being more ’studio’ than many solid state alternatives. No, the AN-Es rely on their qualities of reproduction rather than euphonic introduction to seduce, and subjectively the AN-Es come across as being highly detailed, super articulate and supremely musical, which I’d imagine would manifest itself being highly rated in a blind listening comparison with their competitions, although I could also see that they might not be immediately ‘impressive’ if auditioned in isolation over a short session, unlike Audio Note’s source components or amplification. It’s not that the AN-Es aren’t an impressive speaker, it’s just that I believe their primary strength is their ability to provide long term satisfaction, and that if they were then replaced with alternatives from another manufacturer they would be sorely missed – again, in the long term. The bass of the AN-E’s just seems perfectly integrated and ‘right’ rather than over emphasised, and although I suppose it is important that I do make mention of the bass specifically – this is a review after all – I’m inclined to say that bass really isn’t an issue with these speakers, insofar as I don’t get the impression I’m missing out on the lower registers of recordings even though the AN-Es have neither the driver compliment nor the cabinet size to make the windows buckle in and out. In my own room, which is roughly 15-foot square, I’ve positioned the AN-Es right up against the corners, toed in to face me when I’m sat listening; but because of the doorway in one corner and subsequent ’hall’, the speakers are in fact approximately 11ft apart while I’m of the same distance from each speaker, forming the oft mentioned equilateral triangle. Early AN-Es were typically placed away from corners until a redesign of the rear port meant corner placement became the recommended option for reinforcing the bass response – and although I haven’t tried and don’t intend to try them away from the corners, I’m very content with the ‘sound staging’ and the strong central image the AN-Es project, so don’t feel I need to tamper with positioning. In fact, it was a relief that I didn’t experience any problems after first leveling the four spikes on the AN-E’s purpose built stands to eliminate any rocking, and in general I’d say the AN-Es aren’t the pain in the arse to position you might have read about in regard to other speakers. One aspect of the AN-Es, which they share with my own Revel F30s, is that they’re both placed function over form, although the aforementioned plethora of finishes available to potential owners of the Audio Notes does mean that the rather plain cabinets can be of virtually any wood or finish to suit. Another of the Audio Note’s advantages is that they are far less obtrusive due to their favoured corner placement, and in my case I can now gain access to the rear of my audio racks very easily whereas previously it meant squeezing between one rack and a slightly tipped over F30 due to them being on the same plane. Now, the room seems larger, there’s no ‘dead’ space behind the speakers gathering dust, and swapping interconnects over is a doddle rather than a contortionist’s warm up routine. So there you have a few practical reasons why the AN-Es may be more favourably accepted into the household by your wife/girlfriend (husband/boyfriend? ), who perhaps regards your hobby as a cancer that gradually takes over the room. Yet, perhaps the primary advantage the AN-Es have over the F30s is that of sensitivity. The ‘HE’ version of the AN-Es means that the sensitivity has been increased by 4dB to approximately 98dB, and this, of course, opens up a whole new ball-park in the field of amplification that is pretty much off-limits to the Revels and the vast majority of other transducers. Not having any SETs to hand I can’t add much to the average reader’s exposure to the world of 300Bs, except to say that the review pair of speakers sounded sublime with just 8 watts of power – sublime enough for me to now be scanning Ebay and the classifieds every week for a pair of Audio Note monoblocs. As already mentioned, the bass went deeper and had far more snap than I’d anticipated, and the AN-Es have since demonstrated themselves to be very adept when applied to home theatre duties in my living room. While DVDs don’t exactly demonstrate the subtleties inherent in the best audio CDs, they do test a speaker’s ability to handle the rapid dynamics of gun-shots and explosions, for instance, and my decision to buy the Revel F30s was partly down to the need for a speaker robust enough to handle the rigours of home theatre – something I had initial reservations about with a high-sensitivity design like the AN-Es. Before moving on, I’ll give a quick mention to the custom designed AN stands which were shipped to me after I picked the speakers up from the Northern Hi-Fi Show. Why didn’t I just take the stands used at the Show, you may ask? Well, the Show stands take into account the fact that the seating used while exhibiting typically results in us sitting more upright than we would at home, and so the speakers need to be higher if ears and drivers are to be on the same plane. 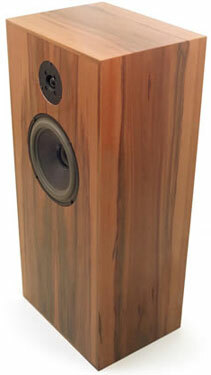 As it is, the non-show stands raise the base of each speaker approximately 11 ½ inch off the ground. After arriving flat-packed in a single though weighty box, four legs/pillars are connected to the top plate of each stand and it is then recommended that they be filled with a mixture of lead shot (from a fishing tackle shop) and sand (from an aquarium). Unfortunately the only fishing tackle shop for miles was shut for repairs when I called in during the stand’s assemblage, and the aquarium only had coral-sand as opposed to the much finer grade I wanted. Being short of time, I opted to buy a bag of builder’s sand which is of course very cheap and easy to source, but the downside was that I had to spoon-feed each leg and then poke the sand through the holes in each leg whereas the fine, dry aquarium sand could have simply been poured in via a funnel. I also had to then compact the sand using a wooden dowel and keep topping up with yet more sand, but eventually I did end up with a pair of solid and quite heavy stands that merely needed the base-plates and spikes fitting. I will emphasise the point again though – do not be a tight-arse, do not use builder’s sand if you have a spare hour or so, DO use aquarium sand (and lead shot if possible). Back to the actual speakers then, which I’d been told would benefit from having the stands filled – the bass would ’tighten up’ significantly, I was advised, and so now back to the listening. When all is said and done the AN-Es are, technically speaking, stand mounts, but their internal volume must approach that of many medium sized floorstanders; and if you consider the majority of enthusiasts concede that stand mounts tend to give a better presentation in the all important midrange than floorstanders having a similar/identical compliment of tweeter/midrange drivers, it’s perhaps logical that a large stand mount might provide an ideal compromise when it comes to providing the ideal balance of midrange and bass response – at least in the size of room typically used in your average UK household. While listening in the AN room, one visitor commented on how it made a refreshing change to hear a speaker where the high frequency and midrange drivers blended together properly, as almost every other room seemed to get it ‘wrong’; again, I’m in danger of repeating myself but with AN gear it usually does come down the overall sound being ’right’ rather than the listener wanting to dissect and analyse the qualities – at least for this listener anyway¼..but I’m writing a review damnit so am forced to dissect and prod away! During my first encounter with the review pair of speakers at the Northern Hi-Fi Show in the Audio Note room, it was also noticeable how the numerous visitors stayed for longer than I’d noticed in other rooms, even though one or two of those rooms did unquestionably have superb systems which definitely were impressive with a capital ’I’. For instance, MBL Audio Systems put forward an extremely persuasive case as to why you should give them your money if you wanted to experience an orchestra/string quartet/band in your living room; but unfortunately the price of the system meant that hiring the orchestra/string quartet/band for the next decade to perform in your living room could be a viable alternative. That being said, it was noticeable that every recording played was of ‘audiophile’ quality, and I wondered how it would sound with real music¼..or should I say with real world recording quality. This is another strength of your all-Audio Note system and, to a lesser degree, a system utilizing Audio Note speakers. Unquestionably you can expect to differentiate between the varying qualities of recordings, but even if you picked up some weather-beaten piece of vinyl from a charity shop bargain bin, you could expect to derive a great deal of pleasure and involvement providing the actual music was capable of transporting you onto that plateau. Although Audio Note does, of course, manufacture components which can sit alongside those of MBL Audio Systems and other esoteric manufacturers price wise, such components weren’t on display in the Audio Note room on this particular occasion, and Mario of AN was enthusiastically alternating between an AN turntable, and an AN DAC 1.1 Sig Mk2 with CDT 2 transport as sources for some excellent music, and this is the crux of the matter for me – the fact that while in the Audio Note room I was busy making notes of recordings I wanted to acquire, partly due to Mario’s superb taste in music, it was also due to the fact that the audio system simply let the music’s qualities shine through. The music was the focus of my attention, not the speakers, the source or whatever. Now obviously I’ve been asked to write a review of the AN-Es and so must determine for our readers (you still here?) what the qualities of these speakers are and what they sound like. Perhaps some of you out there might have done a Google search of these speakers and are trying to compile a short list of transducers to grace your listening room, so you won’t really appreciate the likes of me using woolly analogies that have you wondering what I’ve been drinking or what planet I’ve arrived from. The truth of the matter is that although Audio Note does seem to have a particularly vocal and enthusiastic following among the audio fraternity, who sometimes seem to believe Audio Note have some mystical, almost mythical qualities which separate them from mere mortal manufacturers, there are some superb manufacturers out there well capable of getting you closer to what was put on a recording than was possible during previous generations of equipment, which are reviled as ‘classics‘ nowadays. I don’t think it’s the case that Audio Note have got it right while everyone else has got it wrong; but what I have found to be consistently true in my experience is that Audio Note does seem to have an edge over the opposition (at least those I’ve heard), and in particular their incremental system level approach – which might possibly be confusing to newcomers – does ensure that an Audio Note source, amplification and speakers combination can be put together which gel perfectly and leave no desire for upgrading – until you hear the next AN level up, that is. Bringing to an end my own review of the next to level entry AN-Es, it really is extremely frustrating because here I have a pair of speakers I would heartily recommend to anyone who cared to listen, yet I’m not prepared to come out with the kind of flowery, over the top adjectives which nowadays seem a prerequisite for a review to be deemed even a ’positive’ – let alone a ‘glowing’ review. The fact I now have a pair of AN-Es on my own shopping list says more than I ever could, and I’ve said plenty (good luck with the editing Constantine! ); but for me the Audio Notes have an overall coherence and articulation which results in a more involving listening experience, and this in itself results in more time spent listening to music. So no ’voice coils of God’ proclamations from me then, although I would as an aside suggest that the AN-Es are far and away superior to a pair of speakers I did once own which had that particular (oft used) analogy included in the review. Before being signed up by Dagogo.com to write reviews, I was approached by another publication but declined because I’d been unimpressed by their reviews of equipment I’d heard and was under whelmed by. Basically, I believe that there are many, many components out there which are over-rated and over-reviewed, while genuine stars can remain anonymous and undiscovered. The AN-Es are genuine stars, and although they have received ’glowing’ reviews over the years, it’s all too easy to discount such older designs because technology has apparently moved on and rendered them obsolete – or so the manufacturers and developers of such technology would have us believe. Fortunately Audio Note believe in the old axiom ’if it ain’t broke, don’t fix it’, and decided to refine rather than redefine the simple configuration of two tried and tested, superbly matched drivers in a simple box enclosure with the finest internal components – the results speaking for themselves, so to speak. Apologies to those who expected a review with nicely organised sections for ’sound quality’, ’build quality’, ’conclusion’ or whatever, for I’ve tried to give my impressions of these speakers as if I was talking to a fellow enthusiast who was considering auditioning the AN-Es. Most of us aren’t engineers or experts, but we do usually have the ability to differentiate between a good product and a bad one, and we’re also quite keen to let other enthusiasts know when we’ve happened across a product which reminds us just what this hobby is all about.